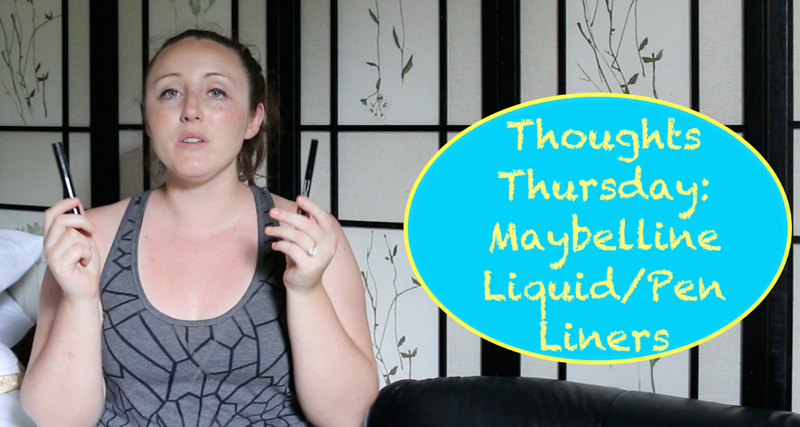 In my DrugStore haul last week I purchased a Maybelline Stiletto Liquid Liner in the color Brownish Black and a Maybelline EyeStudio Pen Liner in Black, today I will be reviewing both of those items for you…. The color of the liquid liner is more of a gold/brown color, which looks really nice and has the tiniest shimmer effect. The tip is soft but firm at the same time, as well as the handle is long enough for you to have good control over the liner. This is also very fast drying liner so you don’t have to worry about it moving after you place it. The pen liner has a 0.4 mm tip!!! So you can get a really close line along your lashes as well as get into the inner corner with no problem. I have used this pen everyday for a week and it doesn’t seem to be drying out yet, like some of my others have. I wish that the cap to this was designed to fit on the bottom of then pen like a typical marker, because I always lose them, as well as I wish the tip was a bit firmer (like the Collections liquid liner), because it is so small you really have to use the side of the pen for filling in your winged liner which is a tiny but of a challenge. You Can see my full video review below…..